This fact sheet provides a brief overview of glioma tumors. Please see Brain Tumors: An Introduction for more information. Glioma is an umbrella term used to describe the different types of glial tumors: astrocytoma, oligodendroglioma, and glioblastoma. 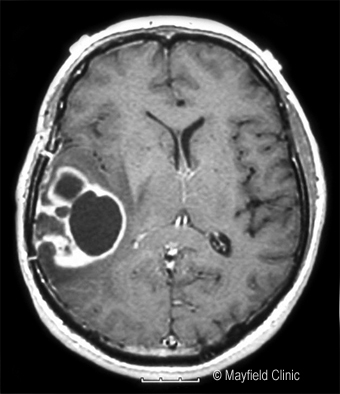 Gliomas vary in their aggressiveness, or malignancy. Some are slow-growing and are likely to be curable. Others are fast-growing, invasive, difficult to treat, and are likely to recur. Symptoms of a glioma are related to the location of the brain in which they occur and may include headaches, numbness, weakness, personality changes or confusion, and seizures. If a patient has symptoms that suggest a glioma, the physician will work with a team of specialists to confirm the diagnosis. Your team may include a neurosurgeon, oncologist, radiation oncologist, radiologist, neurologist, and neuro-ophthalmologist. The doctor will conduct a neurological examination and order CT and/or MRI scans. These imaging tests will help determine the size, location, and type of tumor. If a diagnosis cannot be made clearly from the scans, a biopsy may be performed to determine what type of tumor is present. A biopsy is a procedure to remove a small amount of tumor cells to be examined by a pathologist under a microscope. A biopsy can be taken as part of an open surgical procedure to remove the tumor or as a separate diagnostic procedure, known as a needle biopsy. A small burr hole is drilled in the skull so that a hollow needle can be guided into the tumor and a tissue sample removed. Biomarkers or genetic mutations found in the tumor may help determine prognosis. These include: IDH1, IDH2, MGMT, EGFR and 1p/19q co-deletion. How are the glioma types treated? Treatment options vary depending on the cell type, grade, size, and location of the tumor. The goal of treatment may be curative or it may focus on relieving symptoms (palliative care). Treatments are often used in combination with one another. Gliomas are graded by the cell activity and aggressiveness on a scale of I to IV. Observation –small tumors and tumors located in inoperable areas, such as the brainstem, may be observed and may never grow. Surgery – treatment of choice in most cases. Complete removal can be curative. Radiation – reserved for tumors that are unable to be surgically removed, residual tumor after surgery, or recurrent tumor. Observation – for tumors located in inoperable or high-risk areas that may cause loss of function after surgery. Some tumors may never grow, but others will enlarge or transform to a high-grade tumor warranting treatment. Surgery – treatment of choice if the tumor is able to be removed without causing loss of function. Complete removal can be curative. Radiation – can be used either following surgery to slow residual tumor growth or in cases where surgery is not an option. Chemotherapy – not typically used except for recurrent or some high-risk tumors. Observation – not typically an option due to malignant and rapid growth. Surgery – maximal removal of the tumor is recommended if the tumor can be removed without causing loss of function. Radiation – recommended after surgery with multiple fractions over about 6 weeks. Chemotherapy – given after radiation for 6-12 months; temozolomide (Temodar). Recurrence is common for most patients, and typically occurs at the site of the initial tumor, usually within 2 cm. Treatment of recurrences can include additional surgery, radiation, chemotherapy, or combinations. Figure 1. 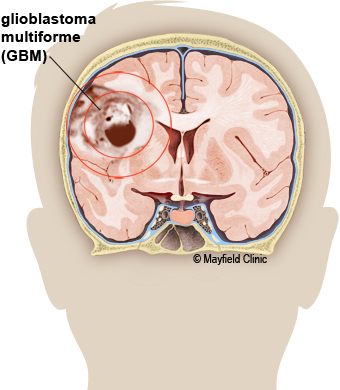 Illustration and MRI of a glioblastoma tumor in the parietal lobe. Surgery – maximal removal of the tumor is recommended if tumor can be removed without causing loss of function. Radiation seeds may be implanted at the time of surgery. Chemotherapy – given during and after radiation for 6-12 months; temozolomide (Temodar). Recurrence is common, and typically occurs at the site of the initial tumor, usually within 2 cm. Treatment of recurrences can include additional surgery, radiation, chemotherapy or combinations. Genomic and molecular analysis has identified 4 subtypes of GBM: classical, mesenchymal, proneural, and neural. All have genes that have mutated, and all have different survival profiles. As yet, there is no available therapy that targets any of these sub-types. Clinical trials are research studies in which new treatments—drugs, diagnostics, procedures, and other therapies—are tested in people to see if they are safe and effective. Research is always being conducted to improve the standard of medical care. Information about current clinical trials, including eligibility, protocol, and locations, is found on the web. Studies can be sponsored by the National Institutes of Health (see clinicaltrials.gov) as well as private industry and pharmaceutical companies (see www.centerwatch.com). Immunotherapy, or biotherapy, activates the immune system (T-cells and antibodies) to destroy tumor cells. Research is exploring ways to prevent or treat cancer through vaccines. Hyperbaric oxygen uses oxygen at higher-than-normal levels to promote wound healing and help fight infection. It may also improve the tumor’s responsiveness to radiation and is being studied experimentally. Currently it is being used to help the body naturally remove dead tumor cells and treat radiation necrosis. Driving privileges may be suspended while you are taking anti-seizure medication for your safety and the safety of others. As each state has different rules about driving and seizures, discuss this issue with your doctor. It may also be appropriate to discuss advance medical directives (e.g., living will, health care proxy, durable power of attorney) with your family to ensure that your medical care and wishes are followed. How well a tumor will respond to treatment, remain in remission, or recur after treatment depends on the specific tumor type and its molecular makeup. A recurrent tumor may be a tumor that persists after treatment, one that grows back some time after treatment has destroyed it, or a new tumor that grows in the same place as the original one. Since it is impossible to predict whether or when a particular tumor may recur, monitoring with MRI or CT scans is essential for people treated for a brain tumor. Follow-up scans may be performed every 3 to 6 months or annually, depending on the type of tumor you had. Medications: to control some of the common side effects of brain tumors. Steroids, such as dexamethasone (Decadron), are used to reduce swelling and fluid build-up (edema) around the tumor. Because steroids can cause stomach ulcers and gastric reflux, famotidine (Pepcid) or pantoprazole (Protonix) are prescribed to reduce the acid produced in the stomach. Surgery: to surgically remove a brain tumor, a neurosurgeon performs a craniotomy to open the skull. The surgeon may remove only part of the tumor if it is near critical (eloquent) areas of the brain. A partial removal can still relieve symptoms. Radiation or chemotherapy may be used on the remaining tumor cells. Stereotactic radiosurgery (SRS): delivers a high dose of radiation during a single session, or it can be broken into 2 to 5 treatments given over a week. Fractionated stereotactic radiotherapy: delivers lower doses of radiation over many visits. Patients return daily over several weeks to receive the complete radiation dose. Whole brain radiotherapy (WBRT): delivers the radiation dose to the entire brain. It may be used to treat multiple brain tumors and metastases. Radiation seeds (brachytherapy): deliver a low dose of radiation from inside the tumor. After tumor surgery, about 50 to 100 radiation seeds are placed inside the cavity. The radiation dose affects the first few millimeters of tissue in the tumor cavity where malignant cells may still remain. Proton therapy: delivers a high-energy beam of protons produced by a cyclotron. The protons travel to a precisely defined depth and deposit their energy in the tumor. Unlike x-ray radiation, the dose does not continue through the body to damage healthy cells. Chemotherapy: drugs that work by interrupting cell division. Unfortunately, chemotherapy affects not only tumor cells but also normal cells. This causes side effects, especially in fast-growing cells (e.g., hair, blood). Chemotherapy can be given orally as a pill, intravenously (IV), or as a wafer placed surgically into the tumor. The drugs most commonly used to treat brain tumors are carmustine (BCNU) and temozolomide (Temodar). Treatment is delivered in cycles, with rest periods in between to allow the body to rebuild healthy cells. Chemotherapy wafers: can be placed in a surgical cavity after a tumor has been removed. They are about the size of a nickel and are made of a polymer that has been filled with BCNU. Bevacizumab (Avastin): is a drug that prevents new tumor-feeding blood vessels from developing. It works by starving the tumor of food and oxygen. It works most effectively in tumors with the EGFR biomarker. Tumor Treating Fields: TTFields slows and reverses tumor growth by keeping cells from dividing. TTFields is used for the treatment of glioblastoma multiforme (GBM) in combination with temozolomide in adults who have been newly diagnosed. It is also approved for treatment of recurrent GBM after surgical and radiation options have been exhausted. Treatment involves wearing a device resembling a bathing cap that delivers electromagnetic energy to the scalp. Hyperbaric oxygen: uses oxygen at higher-than-normal levels to promote wound healing and help fight infection. It may also improve the tumor’s responsiveness to radiation and is being studied experimentally. Currently it is being used to help the body naturally remove dead tumor cells and treat radiation necrosis. The Mayfield Clinic treats more than 1,270 patients with brain tumors a year. Of those, about 350 are glioma type tumors. Our specialists are capable of controlling many brain tumors with a combination of treatments, including chemotherapy, surgery, implant therapy (radiation seeds), radiosurgery, and whole brain radiotherapy. Patients with aggressive tumors benefit from our Tumor Board, a weekly conference where doctors from multiple specialties review and discuss the diagnosis, condition, and best treatment plan for each patient. A Tumor Board review includes the opinions of medical oncologists (chemotherapy), neurosurgeons (surgery), radiation oncologists (radiation), and neuroradiologists (diagnosis). Advances in technology give Mayfield’s neurosurgeons unprecedented access to brain tumors. Image-guided systems enable us to navigate precisely in remote areas and to remove tumors with minimum impact to our patients. Intraoperative diagnostics, including the Mayfield MobileSCAN CT and intraoperative MRI, give up-to-date images of an operation and help surgeons confirm that every bit of tumor has been removed. Radiation technologies like Gamma Knife, Trilogy, and Novalis systems allow us to eradicate some tumors without making any incision at all.